The Foundation was excited to fund this project through our EITC donations. This project is designed to provide students in second through fourth grade with the opportunity to learn beginning guitar in the general music classroom. As the students learn more about reading notes on the treble staff, they will be able to apply their note reading skills to playing and performing the guitar. Providing these instruments and instruction at the elementary level will bring string instruction back into our music curriculum in the Fairview School District and will expand instrumental opportunities for future growth. The Middle school's 5th & 6th-grade math programs are where you will find students using these unique "Lock Boxes". Think of the Escape Room concept, only for classroom content. The Breakout EDU kit allows for the facilitation of games where players use teamwork and critical thinking to solve a series of challenging puzzles in order to open the locked box. Breakout EDU games transfer the ownership of learning from the instructor to the student, making it easy to observe how learners approach problem-solving and apply their knowledge. In addition to the content knowledge needed to succeed in a specific game, all Breakout EDU games require critical thinking, collaboration, creativity, and communication. A Breakout EDU game provides learners with many opportunities to fail forward. Every unsuccessful attempt to open a lock forces the player to try again. The 5th-grade science class is learning about our water system and how our actions can affect groundwater and drinking water. This fun project will illustrate the geologic formation of an aquifer (A natural underground area where large quantities of groundwater fill the spaces between rocks and sediment), how pollution can get into the groundwater, and how this pollution can end up in drinking water wells. Students are to build a model representing the layers of earth and then introduce a "contaminant" to see how it reacts through the layers. What makes this fun for the students is the materials used for the project - chocolate chips, sprinkles, gummy bears, soda, and ice cream are among the items used. Students will be evaluated on the accuracy of their model, behavior during the building process and a quiz on the vocabulary used during the project. This mini-grant was funded under the STEM Integration program of our EITC donations. Kristen Currier, an Environmental Educator with the Erie County Conservation District, was the guest speaker for our 5th-grade science classes regarding this important topic. She demonstrated to the students how the water’s journey connects to their daily lives. She used an Enviroscape model of the local watershed Trout Run. This instruction ties in with their current curriculum and assists in bringing the topic to life for them. The Foundation funded this speaker through our EITC donations. The Fairview School Foundation was thrilled to approve a grant to Ms. Christine Gretka, a physical education teacher at FMS, to purchase an adapted tricycle for a couple of our life skills students. The school had one, but we have 2 friends that would like to use it....now they can ride together! 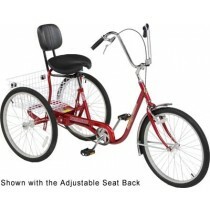 This bike will allow them to be active and improve coordination. Having physical activity during their day allows these students to be more focused when they are in a classroom setting. We are so proud of the extraordinary success of our Middle School Makerspace. Not only is it being used as a classroom setting, but 200 students are part of the “Maker Club” where they can come during their tutorial period. The students are encouraged to collaborate and to be creative and inspired by each other’s ideas. Mr. Brooker, the Middle School’s librarian. With funding from the Fairview School Foundation, this cart will create a Makerspace atmosphere wherever it goes. Teachers now have the ability to check out the cart and bring the STEM technology and innovative mindset to their classrooms. Along with the purchase of the cart, a mini 3D printer, 2 Spheros®, 2 littleBits® Electronics Gizmos & Gadgets kits, LED lights, tape, glue, batteries, magnets, paper, tools, modeling clay, and other crafting type supplies were purchased to stock the cart. This mini-grant was funded under the STEM Integration program of our EITC donations. The Foundation was happy to fund a grant for our AmeriCorps volunteer, Amanda Majerski, for her service project. This service project is a collaboration with students from Fairview Elementary and Strong Vincent Middle School. Title I students will be paired with a student from Strong Vincent as a pen pal. Students will correspond with their pen pals throughout March, writing a total of 4 letters each. After correspondence, students will meet at Frontier Park in Erie. Students, with their pen pals, will read and discuss stories about community and diversity. A local author, Ramone Outlaw, is providing books from his series "Germaine Cabbagehead" for the project. The teacher hopes this will build an understanding and appreciation for differences in people, while also strengthening the students' communication, writing, and reading skills. CVS is currently partnering with high school life skills programs in Pennsylvania to help students with disabilities learn necessary skills to gain employment as a store clerk and/or pharmacy technician. Fairview holds the belief that learning can be a partnership among schools, families, and the community. This program is a proven example of the success that can be achieved when all parties are working together toward one common goal. CVS understands that people with developmental or intellectual disabilities need explicit and routine practice with job skills in preparation for the workforce. CVS will set up a mock store in our Life Skills room for students to have the opportunity to practice tasks such as stocking shelves, price labeling, and organizing items. They also provide adapted curricular lessons that cover the various areas of customer service, uniform wearing, register skills, planograms, reading labels, and cleaning stores. This grant is for the purchase of the cash register for the store. The Foundation is proud to partner with Fairview High School and CVS to bring this program to our life skills students! The Memory Project is a charity organization that allows art teachers and students to make portraits for youth around the world who may have been neglected, lost a parent, involved with violence, or lives in extreme poverty. This project is a great way for some of Fairview High School’s best artists to use their talents to benefit others and to show kindness. The organization will send the art teacher both a physical print and a digital image of a child. The art student will draw or paint that child’s portrait. It will then be sent back to the organization where they will hand deliver the finished portrait to the child. The art student will receive a video record of the event. This project is meant to help these impoverished children to feel valued and important – it also allows our students to become more empathetic and aware of what life can be like outside our small town. The Foundation is proud and excited once again to participate in a small act of kindness that can bring a difference to a child in another part of the world. The Foundation helped bring this animal lesson to life! The curriculum lets the students discover how animal adaptations help them to survive. Do they Blend, Bolt, or Bite? The Erie Zoo has a great program that lets the students see up close the animals and what they use to exist in the wild. Mrs. Welsh’s 5th-grade science class was the setting for the activities. This mini-grant was funded through our EITC donations. The Foundation was able to provide the funds for 5 of our middle school special education students to attend a program offered at the Blended Spirit Ranch in Fairview. Their teacher, Ms. Brooke Weaver, wanted to provide something for her students during the extended school year that would be meaningful and engaging. Some of the objectives of this program were to gain self-esteem and confidence, teach responsibility and empathy for others, and to provide good outdoor physical activity. The students thoroughly enjoy their experience!